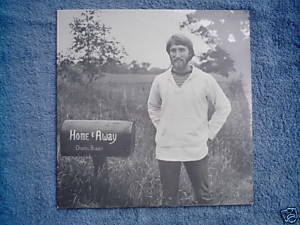 Shagbark un-numbered vinyl LP (1982) Charles Brauer Home Away with Peter Ostroushko, fiddle, mandolin, guitar, backup vocals Butch Thompson, clarinet, piano John Foster, bass C.C. Richelieu, banjo Miss the Mississippi and You/Go! Darn Wheel/One Blue Chip/When the Wagon Was New/For Grandpa/Dunderbeck/Hungry Hash House/Knicknack/Rank Stranger/Sourwood Mountain//Sprtin' Life/Two Stories/Have You Seen/Wish I'd Stayed in the Wagonyard/Always Friends/The Blanket/Show Me the Way To Go Home/Home/Away/Whippoorwill Still sealed. Some of the plastic has been cut away from the front, no effect on the cover itself.